Yesterday, I had a preview of the Havaianas 2014 collection at the all-new CommonThread concept store at Ion Orchard. There are so many new designs and colours in store for us next year. Here are a few of my favourites. CommonThread (CT) is an exciting new retail concept that offers hand-picked collections to create your personal style story. All the collections at CommonThread are trendy, virbrant and creative. 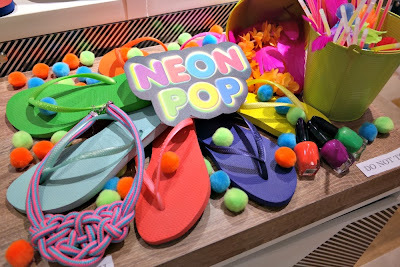 The merchandise supports the fun and carefree Havaianas lifestyle. Bensimon - A French-heritage brand of sneakers. They are canvas and rubber soles... in sporty summer colours. Love the raw-meets-chic style of this brand. Hoola- this eyewear brand has stylish retro sunglasses. If you love old school styles like aviators, wayfarers and classic rounds, you will love Hoola. Praiaz- These are all terraine beach shoes that are for swimming, walking, dancing.. and even running. They are all rubber... and smells of coconut ( I kid you not). Loads of other brands of clothes and accessories at CommonThread.... pop in and check it out for yourself at ION Orchard (B2-18). Here's what I chose for myself and David... new Havaianas for our holiday in Phuket next week. Can't wait!